STEAMBOAT SPRINGS — The good news finally came for Taylor Fletcher after 1,431 days of working every day since he finished his last event at the 2014 Winter Olympics. It came in the very last qualifying event and four days before the deadline to announce the competitors for the 2018 Winter Olympics in Pyeongchang, South Korea. The good news came for Jasper Good on Thursday, the last day possible. The International Olympic Committee took three days to decide which nations got how many spots in South Korea, and a retirement in Slovenia of all places meant the United States got a fourth spot, and that meant Good was in. Two native sons of Steamboat Springs found out in the final week that they were going to the Olympics. The news was met with excitement in Steamboat, but another local skier, Ben Berend, had to take time to himself, so he left his best friends and teammates behind and sank into a chair in the lobby of the team’s hotel in Seefeld, Austria, trying to come to terms with it all — the fact that while others had gotten that last-day phone call, he hadn’t. While all of his best friends were going to the Olympics, living the dream they’d shared since they were boys, he wasn’t. That’s where his coach found him, deep in regret and sorrow. It had been the roughest of days. The writing had been on the wall in terms of making the team, and he knew it was his own fault. He’d gotten a slow start to the season, especially compared to his teammates. U.S. team veteran Bryan Fletcher was the first to lock up a spot, winning the late-December U.S. Olympic Team Trials to ensure he’d be going to his second Olympics. Ben Loomis, a 19-year old from Eau Clarie, Wisconsin, was, for all practical purposes, next thanks to strong results on the Continental Cup. 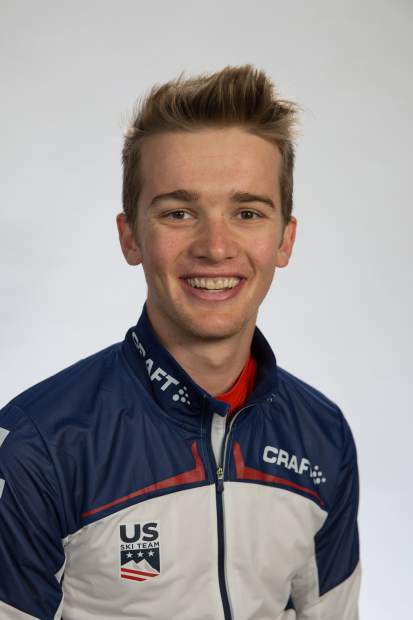 Berend had started the season competing on the World Cup, the No. 3 skier on the team and a favorite to make the Olympic squad, but he hadn’t had a single noteworthy finish at that level. He came home to compete in Continental Cup events in Steamboat Springs, and while he was better there, he finished behind Loomis and Good. He’d be better in January, he said, when the competitions shifted to a massive ski jump hill in Germany more suited to Berend’s style, but, that didn’t work, either. The other team spots began to fill up. Loomis kept up solid results. He’d be going to the Olympics, the youngest skier on the Nordic combined team. “The Olympics are something I have always dreamed of and to go at such a young age is extremely exciting,” Loomis said in a U.S. team news release. Then Taylor Fletcher locked up his spot with a dramatic last-stand performance on the Continental Cup, earning a third-place finish on Sunday in his very last opportunity to so. That ensured he’d be on the team and be a three-time Olympian. Good, too, was very solid early in the season and just strong enough late to maintain his spot in the rankings. When the U.S. found out early Thursday morning it would definitely have a fourth spot at the Olympics, it went to Good. Berend’s one ray of hope in the final weeks was a strong performance at a pair Continental Cups in Ruka, Finland, but he still sat behind four of his teammates in the point standings, solidly fifth when the U.S. would be lucky to get four spots. Berend would be happy for Good, his best friend, no question, but sitting in a lobby in Austria he mostly just felt sorry for himself. He texted his parents the confirmation. The dream, at least for 2018, was over. They canceled their plane tickets to South Korea. Being summoned by coach Jan Matura didn’t change anything about Berend’s mood, but Matura came, he followed. Except Berend didn’t know one thing. An international shuffling — even some U.S. team staff isn’t sure what exactly happened — had opened one final spot in the field of 55 racers. The U.S. Olympic Team announced 12 new athletes Thursday. Steamboat Springs-trained ski jumper Nita Englund, from Florence, Wisconsin, made the cut for the women’s team, along with Park City, Utah, duo Sarah Hendrickson and Abby Ringquist. Nordic combined, then, will have five. Steamboat’s Bryan Fletcher is in for his second Olympics. His younger brother Taylor Fletcher is back for his third. Ben Loomis is in for his first, as is Steamboat’s Jasper Good, and, even when he was sure it wasn’t possible, so is Steamboat’s Ben Berend, an Olympian against all odds. “I felt every emotion that comes along with missing out on a dream this big, and it was devastating,” he said. “Then I got to feel the pride on the other side of that. It was totally insane, exhausting and awesome. The Olympics begin Feb. 9 with Opening Ceremonies. The Nordic combined normal hill event is Feb. 14 and the large hill event Feb. 20. The four-man team relay is Feb. 22. Thursday’s announcement brings the total number of Steamboat-trained athletes in the 2018 Olympics to 15.